Do you want to trigger a pop up campaign with the click of button? It’s easy with our MonsterLinks! 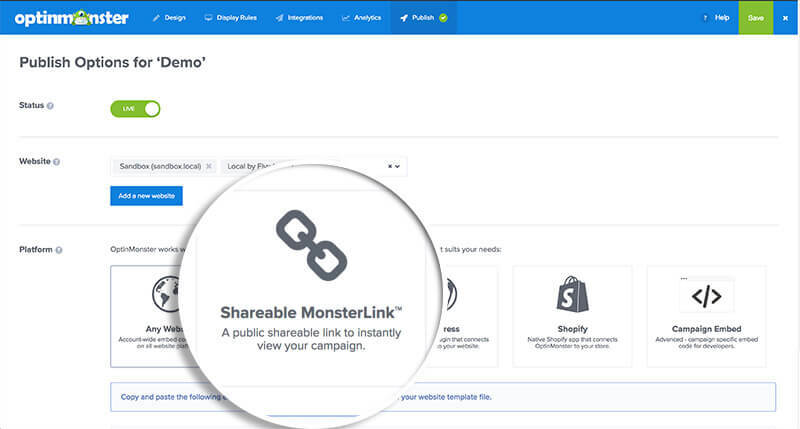 Follow this guide to set up a MonsterLink and load a campaign of your choice with the click of a button. 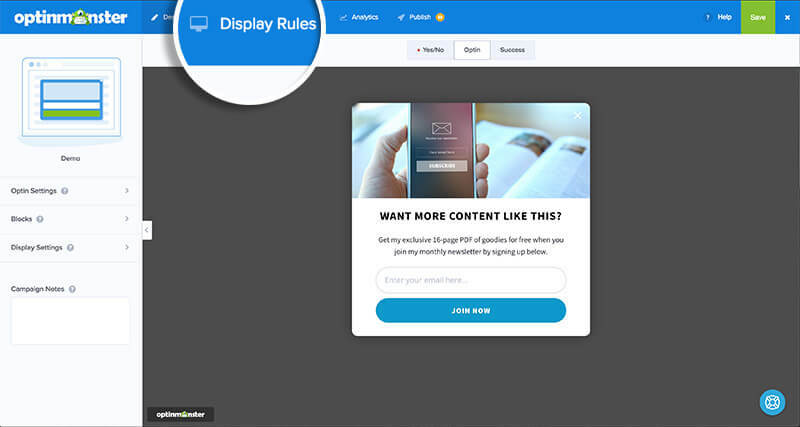 NOTE: This guide will show you how to effectively use the Display Rule: visitor clicked MonsterLink. Can I split-test a MonsterLink? Can I have one campaign for desktop users and another campaign for mobile/tablet users on the same MonsterLink? Do I need to use both the WordPress Plugin and the Display Rules? Can all Campaign Types be Made into a MonsterLink? Can I create a landing page where people can signup for my Campaign? REQUIREMENTS: MonsterLinks require a Pro Subscription. A MonsterLink is a link on your site that loads a pop-up campaign instead of sending the user to a new page. You can use MonsterLinks to create a better viewing experience for your users by using a Call to Action button that prompts them to trigger the campaign instead of triggering a pop-up automatically and potentially interrupting their browsing experience. You can also use MonsterLinks to show campaigns on mobile devices in a non-intrusive way. Select the Display Rules tab in the campaign builder. In the Display Rules Conditions panel set one condition for visitor clicked MonsterLink. If you are using the WordPress OptinMonster API plugin, you will need to update your WordPress output settings to make sure your MonsterLink campaign loads everywhere. Go to your WordPress Dashboard > OptinMonster Menu > Output Settings (for your specific campaign). Enable your campaign. In the Campaigns tab this means your campaign will appear with the status Live instead of Disabled. Ensure all Advanced Output Settings are Disabled – This will ensure the MonsterLink™ Campaign Embed code is loaded globally so that you can add a MonsterLink™ anywhere and it will work. NOTE: See our display rules documentation for a walk-through of the output settings. IMPORTANT: Before the MonsterLink campaign can work properly, the campaign must have its embed code loaded on the page(s) where your link will be placed so that your MonsterLink actually has something to load. Otherwise, the campaign will load as a separate webpage. If you are not using the OptinMonster plugin, and have not already added the embed code to your site, see our documentation on how to embed your campaigns on your site. To get your actual MonsterLinks™ on your page, you will need the campaign’s MonsterLink URL. To get this, go to the Publish tab. Under Platform, click Shareable MonsterLink. You can copy just the URL or you can copy the HTML version of the link. Next, you can paste your link somewhere on your site. If you are using an editor, you may only need the URL. If you are using the HTML code, it will look something like the following (although your slug on the end will be different). NOTE: These are examples. For your campaign, you must change the slug on the end of the URL to your own campaign’s specific slug. If you only copy and paste the code below but neglect to update the campaign’s slug attribute, then it will not work. This text MonsterLink is an example of adding the MonsterLink as text on your page and uses the default MonsterLink code. In WordPress, this is done by editing in the Text Editor NOT the Visual Editor for a page/post. Very similar implementation to the text link, but this time you use it to make a button. Your default button design depends on your CSS on your site. NOTE: You may need to replace the class “button” with your own theme-specific class. Some themes use button as a class while others use alternative naming conventions. Refer to your theme’s documentation for information about button classes. This option, once more, is very similar to the text implementation. Only this time, the a tags are wrapping around an image you have instead of text like “Click Me”. This allows you to create an advertisement of sorts that is clickable and will load your campaign. Q: Can I split-test a MonsterLink? A: Yes, you can Split-Test a MonsterLink. In these situations, the split-tested version will show up using the primary campaign’s slug in the MonsterLink. You do not need 2 links. Q: Can I have one campaign for desktop users and another campaign for mobile/tablet users on the same MonsterLink? In this example I used the classes desktop-monsterlink and mobile-monsterlink to indicate which MonsterLink should be available for a user to select from various devices. Q: Can all campaign types be made into a MonsterLink? A: No, Inline campaigns are embedded into the page so they cannot be made into a MonsterLink. Q: Can I create a landing page where people can signup for my Campaign? A: You can do that using our Shareable MonsterLink feature. It is a standalone page located on our server that serves as an independent URL that you can share through email, Facebook, or other social media, which allows your subscriber to see a specific OptinMonster campaign. Check out how to Create a Shareable MonsterLink here.